Lambeth sits at the heart of a new filmic ode to London, featuring Idris Elba and Gemma Arterton in its ensemble cast. In A Hundred Streets, very different lives, led within a mile of each other, are inter-woven. Filmed between August and October 2014, Elba and Arterton play a former rugby player and his estranged wife. A singing cabbie (Charlie Creed-Miles) and his wife (Kierston Wareing) find their lives falling apart after an accident. And a reluctant drug dealer (Franz Drameh) tries to put street life behind him, after being inspired by a retired actor (Ken Stott). It opens on November 11th. Take a look at the trailer here. True to its theme of community connections, the production gave four local unemployed young people a paid break in the film business, and provided a generous donation to a local tenants and residents association. 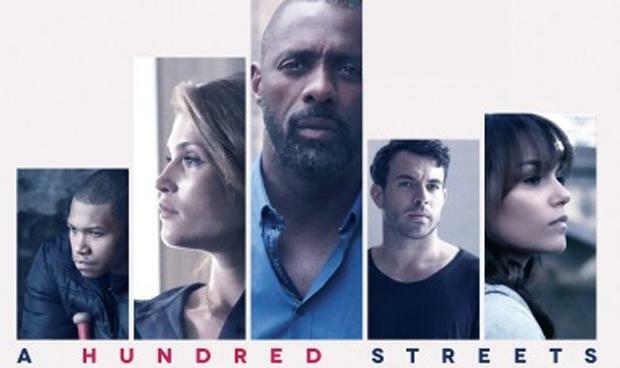 Among the local locations to spot, you’ll see Miles Street, where Idris Elba is thrown out of a nightclub for being drunk. He walks toward the next door, but he is stopped by police, and arrested, with a crowd of clubbers looking on. And on Wandsworth Road at the top of St Rule Street, we see from a moving vehicle, a motorist being assaulted next to his car. FilmFixer manages the film office service for Lambeth Council. FilmFixer director Andrew Pavord congratulated the production for its conduct in the community, “particularly in providing paid work for four days to local young people. “The characters in A Hundred Streets cross paths, in a message of hope for what’s possible in London. It keenly observes the cheek-by-jowl nature of our lives in the capital. “In keeping with this sentiment, we’re delighted that the opportunity for paid work was made to local young people who are keen to get a start in filmmaking. “Unemployed young people living on Lambeth housing estates can view the film business as remote and inaccessible – something that goes on at a great distance; it’s doors shut to young people with their background. However, when filming comes to your front door, it’s important that work opportunities come with it.